Breeding Range: Throughout North America in suitable habitats. Breeding Habitat: Bottomland Hardwood, Inland Open Water and other waterways including streams, rivers, ponds, lakes, and estuaries (Hamas 1994). Nest: Burrow in sand bank, usually 1-2 meters in length (Ehrlich et al. 1988). Nesting Dates: Eggs: late April to early June (Robbins 1991). Foraging: High dives (Ehrlich et al. 1988). Habitat use during Migration: Usually found along shorelines of lakes, rivers, other water bodies (Hamas 1994). Arrival Dates: Late March to late April (Robbins 1991). Departure Dates: Mid-September to early November (Robbins 1991). Winter Range: Across the U.S. where open water persists (Hamas 1994) south to Central America and occasionally northern South America (DeGraaf and Rappole 1995); a few winter in southern Wisconsin (Robbins 1991). Winter Habitat: Areas of open water including swamps, rivers, lakes (especially with quiet, shallow bays), lagoons, river oxbows, mangrove and island coasts in tropical regions as well as river and lake shores (Hamas 1994). Throughout its range, the Belted Kingfisher inhabits riparian areas with extensive open running waters in which prey are clearly visible. In Wisconsin, it occurs in northern swamps and bogs (Hoffman and Mossman 1993), Lake Superior coastal wetlands (Elias and Meeker 1999), southern Wisconsin floodplain forests (Mossman 1999), sedge meadows, (Mossman and Sample 1990), cranberry bogs (Jorgensen and Naumann 1993), deep marshes and shallow open water habitats (Hoffman 1990) and other upland and lowland sites with appropriate nesting substrates (Berner 2006). Foraging areas can be up to 3.2 km from nest sites, which generally consist of earthen banks devoid of vegetation. The Belted Kingfisher excavates burrows extending 1-2 meters into sand banks, gravel pits, or other steep, exposed sandy soil sites. Tunnels often slope upward from the entrance, possibly to prevent flooding the nest (Hamas 1994). Because the Belted Kingfisher uses a wide variety of aquatic habitats, it is difficult to describe habitat availability in the state. Local populations may be most limited by the availability of suitable nest sites, which are ephemeral and largely dependent on erosion. Flood control and bank stabilization activities often result in loss or alteration of natural nest sites. However, road cuts, gravel and sand quarries, and other activities that create vertical banks in friable soils can benefit this species, assuming disturbance is minimized during the nesting period. Factors that reduce availability and visibility of aquatic prey, such as sedimentation, water pollution, and proliferation of carp and other invasive species can lessen the suitability of foraging areas (Hamas 1994). 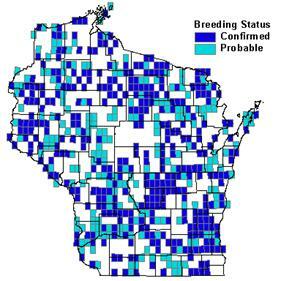 Breeding Bird Survey data suggest significant population declines range-wide and non-significant declines in Wisconsin (Sauer et al. 2005). The Belted Kingfisher is considered a fairly common migrant and summer resident in Wisconsin. During the six-year period of the Wisconsin Breeding Bird Atlas, observers confirmed breeding in 31% of the surveyed quads (Berner 2006). 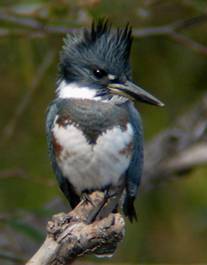 Maintaining water quality and suitable nesting sites are essential to the conservation of the Belted Kingfisher (Hamas 1994). Measures that improve or maintain high water quality standards will help protect the integrity of foraging sites for the Belted Kingfisher. Because this species may be limited by the availability of nest sites, all sites with active burrows or suitable substrates should be identified and conserved in Wisconsin. Wherever possible, managers should consider maintaining natural cycles (i.e., flooding and erosion) in riparian ecosystems, which will benefit many riparian-associated species. However, public education on the importance of these natural processes is needed. Because high levels of human disturbance can prevent the use of otherwise suitable habitat (Mazeika et al. 2006), nest sites at quarries and other human-altered habitats would benefit from fewer disturbances during the breeding season. Factors contributing to this species’ decline need to be identified and mitigated. Artificial nest burrow construction warrants study and more research also is needed into reproductive success at commercial sand and gravel operations. Because this species is not well-monitored by conventional techniques, improved survey methods are needed. Berner, M. 2006. Belted Kingfisher. In Atlas of the Breeding Birds of Wisconsin. (N.J. Cutright, B.R. Harriman, and R.W. Howe, eds.). The Wisconsin Society for Ornithology, Inc. 602pp. DeGraaf, R.M. and J.H. Rappole. 1995. Neotropical migratory birds: natural history, distribution, and population change. Comstock Publ. Assoc., Cornell Univ. Press, Ithaca, NY. Elias, J.E. and J.E. Meeker. 1999. Plant communities and birds of six Lake Superior coastal wetlands. Passenger Pigeon 61(3): 323-336. Hamas, M.J. 1994. Belted Kingfisher (Ceryle alcyon). In The Birds of North America, No. 84 (A. Poole and F. Gill, Eds.). Philadelphia: The Academy of Natural Sciences; Washington, D.C.: The American Ornithologists’ Union. Hoffman, R.M. and M.J. Mossman. 1993. Birds of Wisconsin’s northern swamps and bogs. Passenger Pigeon 55(2): 113-137. Jorgensen, E.E. and L.E. Nauman. 1993. Bird distribution in wetlands associated with commercial cranberry production. Passenger Pigeon 55(4): 289-298. Mazeika, S., P. Sullivan, M.C. Watzin, and W.C. Hession. 2006. Differences in the reproductive ecology of Belted Kingfishers (Ceryle alcyon) across streams with varying geomorphology and habitat quality. Waterbirds 29(3): 258-270. Mossman, M.J. 1988. Birds of southern Wisconsin floodplain forests. Passenger Pigeon 50(4): 321-337. Mossman, M.J. and D.W. Sample. 1990. Birds of Wisconsin sedge meadows. Passenger Pigeon 52(1): 39-55.